Sorting medical - distribution of the affected patients and their mass receipt depending on the nature and severity of the lesion (disease) groups needing homogeneous medical-preventive or emergency events and sequenced and care to each group or sequence and method of evacuation. Since the conduct of hostilities beginning to be accompanied by significant sanitary losses (see Sanitary losses of troops), you need to use the medical sorting with the aim of providing medical care to those most in need. First theoretically justified the doctrine and methodology of medical sorting and brilliantly realized in practice N. I. Pirogov. Arriving in 1854 in besieged Sevastopol, it started its activity not with surgical benefits, and with bringing order to the dressing stations and first of all with the medical sort. N. I. Pirogov wrote: "Convinced soon after my arrival in Sevastopol that simple razporeditelnite and order on the dressing area is much more important than the purely medical career, I have made myself-rule: not to start operations immediately when carrying the wounded on these points, not to waste time for a long benefits and engage patlagele their sort. Without medical sorting it is impossible to do in all cases where medical care even in peacetime simultaneously receives a large number of affected patients. If, for example, in the hospital as a result of natural disaster or railway accidents are delivered at the same time a large number of victims, to doctors of the first and foremost task is to conduct medical sorting. In the conditions of combat conditions, when the mass flow is affected by the rule, medical sorting is particularly important. During medical sorting on the stages of medical evacuation (see) primarily from the General flow of the affected detected dangerous to others (infected PB, persistent S, infectious or suspicious for infection patients) in order to prevent contact with them and to take possible measures for their neutralization (deactivation, decontamination and other). Established groups affected, which you want to render medical assistance at this stage and that it can be postponed to the next. In respect of the first group in accordance with the nature and localization of lesions (disease) and General condition of the victim is established, in which medical care (by volume, character) he needs, and in what order she should be provided. Depending on this, and is determined by the functional unit of the given stage (operational, resuscitation, dressing etc), in which this assistance should be provided to him. Further dealt testimony to the delay affected (patients) at this stage, depending on the severity (disease). So, are left nontransportable until it is possible further evacuation and legkogruzovye to recovery. In respect of each subject evacuation is established, where he had to be evacuated, what transport, in what position (sitting, lying) and which turn (first or second). Medical sorting is performed only on the basis of the diagnosis and forecast. Depending on the diagnosis dealt with the need to assist affected (the patient) at this stage, its nature and the place, is determined by the order of this support, set the indications and contraindications for evacuation, urgency and priority of this evacuation. Depending on the forecast, the question about the possibility of recovery of affected or the patient at this stage, with the subsequent return it to the system or whether further its evacuation in the rear (in connection with the duration of the period for cure). 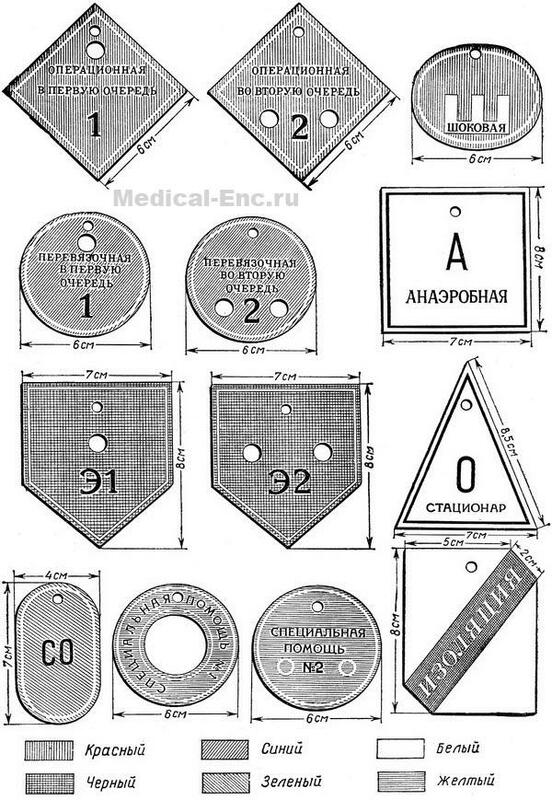 Medical sorting can be divided into two types: vnutriportovaya that defines the procedure for injured patients within the clinic, this will set the order and place of rendering assistance at this stage; and aviatransportnoe that determines how the affected areas (patients) beyond this stage, however, the question about the order and the way of their evacuation, and where they should be evacuated (destination). For the medical sort created certain conditions. At each stage of medical evacuation for these purposes is allocated specially equipped reception and sorting office, including sorting space. Admission to the stage in a short time a large number affected, doctors conducting medical sorting, as a rule, exercise it without removing the bandages and the careful history taking, guided mostly only external examination of the victim. Because of this medical sorting should be placed at the most experienced doctors. The results of the medical sort fixed the corresponding colored marks (marks)that are attached to clothing affected (the patient) or to handles the stretcher (Fig). Marking allows younger medical staff without additional instructions, guided only classification stamps, send in those or other unit, or to perform loading amazed on transport in strict accordance with the decision of the doctor conducting the sort. Elements medical collation are used already on the battlefield. Middle and Junior medical personnel with multiple affected, when deciding on the order to assist them or order of removal (export), produces essentially medical sorting. The value of the medical sort especially increases in the war with the use opponent of nuclear weapons, characterized by odnomomentnoe and mass occurrence of sanitary losses and the receipt of the stages of medical evacuation in the short term to the large number of affected. The medical service should be ready to implement medical-evacuation ensure large masses of the affected population. Therefore, medical personnel, designed to implement this provision, should know the principles and methods of conducting health sort. Any significant differences in the conduct of medical sorting in conditions of civil defence no. It should be emphasized that, in addition to the diagnosis and prognosis, the medical personnel engaged in medical sorting in these terms, shall be guided by some social aspects. So, for example, childbirth, postpartum, children should be granted a preferential right for primary evacuation. Sorting marks: e - evacuation, decontamination, (numbers indicate the sequence).